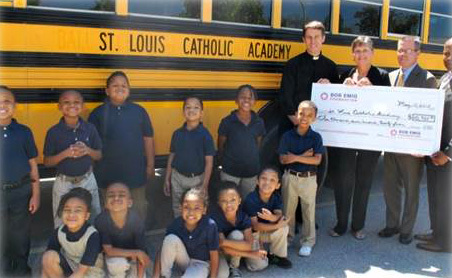 May 28, 2013 — MARYVILLE, IL —- The Bob Emig Foundation has helped a North St. Louis grade school provide opportunities for its students to expand participation in sports and academic events by raising funds for a school bus. St. Louis Catholic Academy, where over 75% of the students are near or at the poverty level, was able to purchase the bus this spring. A portion of the funds was a result of a grant from the Wachovia Wells Fargo Foundation. The majority of the funds were raised at the Bob Emig Foundation’s Celebrating Leaders in Youth Sports event held last fall, where role model athletes, coaches and volunteers are honored for being example of the qualities that the foundation promotes. The Bob Emig Foundation is named for the late Bob Emig, an area sportswriter and a leader in developing youth through participation in sports. In line with Bob’s passion, the Foundation focuses on “Inspiring Youth…Transforming Lives” by promoting the well-being of youth through sports. It focuses on providing opportunities for youth to experience the benefits of healthy youth sports activities, educating youth athletes in the areas of health and life skills development, and recognizing athletes, coaches, volunteers and officials who “go beyond the game” to provide youth with a learning life experience. Bob was the Director of Competition for the Prairie State Games, Illinois’ largest amateur sports festival. In 2001, he was named to the Illinois High School Basketball Association Hall of Fame for his media contributions throughout the years. Bob was also a Lifetime Honorary member of the Baseball Writers’ Association of America.